A Stronger Flow of Leads- Consumers who see your positive reviews are more likely to take an interest in your company in the first place. A larger percentage of them will visit your website, read your content, or follow you on social media, thereby taking the first steps toward purchasing your products. Click-through Cultivation- Besides getting more customers to take an initial interest in your company, positive reviews make those interested customers more likely to complete a sale. As they explore your website and content, the idea that you have satisfied past customers will remain in the back of their minds. This will make it easier for them to trust the claims you make about your product or services and decide that they, too, could benefit from giving you business. Enhanced Conversion Effectiveness- When you offer customers free trials and other deals to encourage conversion, there is always a risk that those customers will like your product or service, but worry that you will not offer the same quality over the long haul. Reviews make it clear to them that their good experiences were not one-offs. When they realize that other consumers have had consistent good service, they will be more willing to become loyal customers. Reviews are invaluable for companies of all sizes, ages, and industries. Whether you are a new startup trying to expand your customer base or an established business seeking to lower the cost of its publicity, the more and better reviews you get, the easier it is to meet your goals. 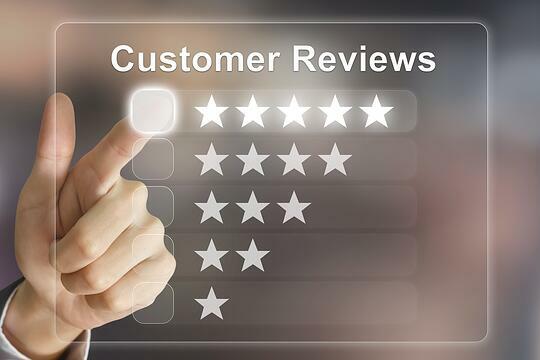 Gentle Reminders- Many customers who have had good experiences with you simply don't think to leave reviews. Thus after each sale, ask the customer if they had a good experience and then politely suggest they publish their thoughts. For online sales, have your website direct customers to your review page after they finish paying. Comprehensive Customer Support- Invest in a customer support staff that will respond to each inquiry quickly, courteously, and with comprehensive information. This allows any customer who is confused about your services to learn all they need to fully benefit from them. As a result, more customers will have good experiences, making more of them willing to leave good reviews. Bad Review Rapprochement- If someone leaves a bad review, politely ask them what went wrong and offer to make it up to them. Many reviewers will respond by not just removing the bad review, but even replacing it with a good one. Don’t pass up a chance for powerful, positive publicity. For more information on the benefits of good reviews and other lead generation tips, contact us today.